Surfing Surgeon Stuck in the Sand: More Cheese And A Valentines Surprise! More Cheese And A Valentines Surprise! I'm blogging today sitting next to a nice crackling fire in... wait for it... SAN DIEGO!!! What the heck? Yeah. Last Friday, as I was enjoying a Cactus Viper Margarita at Zuni Grill on the Riverwalk in San Antonio, something magic happened. My phone rang. What's magic about that you ask? Well, aside from the fact that I'm not very popular and no one ever calls me, the caller happened to be my OIC for this lovely vacation I'm about to take, AND he had good, no, GREAT news! Seems transportation for our team won't be available until sometime after the weekend of the 25th! That translated to an entire week of... well... freedom! Now, I was already in a good mood seeing as how I was out of the cold of Fort Dix, drinking a margarita on the Riverwalk, and waiting for my sweety to arrive for a romantic Valentines weekend, but that news made it all that much sweeter! OK. Now that I've got the excitement out of the way let me back up. Our final week of basic combat training went as expected. 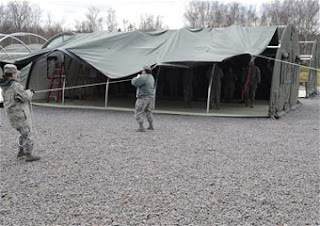 Pretty much more of the same stuff but we did spend two nights out at the mock FOB sleeping in tents and practicing more IED identification and convoy operations. We got blown up, towed "disabled" HMMWV's out of danger, and froze our hindquarters off in some of the coldest, windiest conditions we've had while here! Once we finished all that, Wednesday afternoon, we headed back to the dorms and started to prepare for the next leg of our journey. 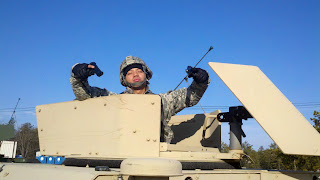 Our turret gunner with his "gat's". He's known for being straight up gangsta' and he ALWAYS keeps one in the chamber! Thursday afternoon we "validated" (code for completing the course, but more importantly, code for MILLER TIME!). We all headed our separate ways for a couple of days R&R prior to reporting to Camp Bullis for our next phase of pre-depolyment training. 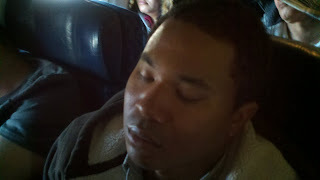 I headed to Philadelphia with HM3 Cecil to catch flights down to Texas. Cecil's family was headed to meet him in San Antonio so he had a scheduled flight for that evening while I was set to leave bright and early Monday. 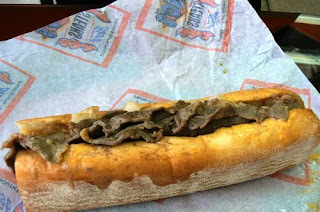 We had plenty of time and when I heard that Cecil had never been to Philly I proposed a side trip to the best cheesesteak place in town, and therefore, the world, (which one is that? Click here to see!!!) 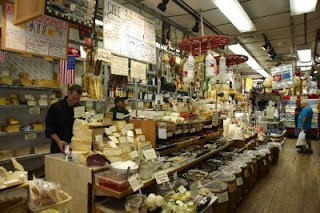 followed by the best cheese shop in America! Cecil was skeptical about cheese whiz on a cheesesteak but it took only one bite of that chewy roll filled with hot, grilled steak, onions and peppers and topped with the perfect amount of salty, cheesy whiz to convert him! stop for me when I lived just up the street, it was every bit as amazing as it has always been. We picked up some Jamon Iberico and a bunch of cheese and chocolate to share with our families over the coming weekend. If you're ever in Philly, check them out at the original location on 9th street or their big store on Chestnut in Rittenhouse. Otherwise you can order from them online. After the cheese adventure was concluded I dropped Cecil at the airport and then headed to check in at the Ritz. Yeah. The Ritz. How can I afford the Ritz? I'll tell you. Unlike most of the huge expensive hotels out there that have made money hand over fist thanks to the freedoms provided them by our predecessors, the Ritz actually offers a SUBSTANTIAL military discount as a token of appreciation for what servicemen and women do. Like, substantial enough that it's almost as cheap as staying at a Best Western or a Holiday Inn. So here's to the folks at Ritz-Carlton for giving us something back! Nice dinner at Alma de Cuba followed by gelato at Capo Giro and then a few Yuengling at Moriarity's with an old buddy and it was time to turn in. I hit the sack and woke up bright and early to head to San Antonio. My flight out of Philly was a bit delayed and despite a sprint through the airport in Dallas, I missed my connection. I caught the next flight with two of our super-corpsman, Richardson and Medina-Reyes and hit San Antonio around noon. Checked into the hotel and headed to Zuni for a margarita, which brings you all up to how this whole entry started. May and I had an amazing weekend! We ate good food, drank good bourbon, and smoked good cigars. We went to the stock show and rodeo and window shopped the markets. Best of all, we held hands and just walked the Riverwalk. Apart from being one of the most, if not THE MOST, romantic weekend we've ever spent together (her words, by the way, though I happen to agree), much of what we experienced brought why we fight for our and others freedom into sharp focus. cannot, at least not publicly. Next came flag after flag after flag welcomed with cheers and genuine American pride. Finally, the National Anthem, sung beautifully by a gentleman who not only sang that sacred hymn the way it was written, but actually knew all the words. We enjoyed watching the roping and riding and then headed back downtown but I couldn't help continuing to notice reminders of why we do what we do. Families from every walk of life enjoying the sun and serenity of the riverwalk. Clean water coming from every tap of every kitchen and bathroom. The bounty of food at the huge brunch we ate Sunday morning. Freedom to just walk down the street with little fear of violence. All these things, as ordinary as they are here, are truly remarkable when held up to the world as a whole and I thank God every day that I am an American. Well, like all good things, the weekend eventually came to an end. 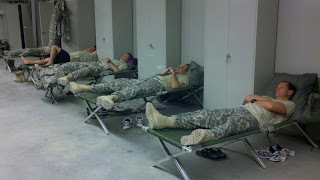 An early end at that, as I had to report to Lackland at 4:30 AM Monday. I kissed my amazing wife goodbye and caught a cab to the Gateway Villa where we all boarded a bus for EMEDS training at Camp Bullis. Camp Bullis is a vast expanse of rolling hills and oaks. It's actually quite pretty when the weather cooperates as it did the majority of our week there. The course cadre were knowledgeable and enthusiastic but, honestly, a majority of the week was somewhat, um, irrelevant to our upcoming mission. We had a bunch of lectures about the EMEDS system which is basically a flyaway hospital which can be transported anywhere in the world on a couple of C-17's. 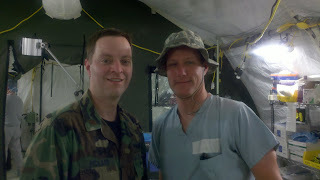 Full OR capability, lab, x-ray, blood bank, ER, ICU, and an inpatient ward can be deployed and set up in about a week. Actually a very cool thing. If you're in the Air Force on an EMEDS team. But... we're not. which was a bonus, and the Air Force folks in the course were all great people so, despite the boredom of the first two and a half days, the course was alright and the reward of a week home that I'm enjoying now makes it all worth it! Now it's kinda late and I'm kinda tired so I'm gonna enjoy spooning with my honey and sleeping in my own bed for a few more nights. I hope to get in a surf or two, ride Sweetwater with Cam, eat a burger at Hodad's, and drink some beers at Keg and Bottle before heading back to the cold of New Jersey and then on to points beyond. Thanks to all of you following for your well-wishes, prayers, and encouragement! Loved this post! Those unexpected breaks are the best, and do wonders for everyone. I have a lady who asked me if I knew anyone that was oversees that we could send valentine's to. (Her daughters class made them). I thought of you since you'd have the opportunity to give them to those you work with & patients as well. Obviously we've missed valentine's but if you think you could use them once you are downrange let me know and we'll send them over.